Waking up to a fluttering noise near ones ear is immensely un-fun. And when one realizes that the fluttering noise resides INSIDE the ear, it becomes a remarkably disturbing scenario. This can be THE ONLY logical answer, am I right? It's the middle of the night and I can't sleep, because...really...who can when you have such an epic battle raging in your ear. 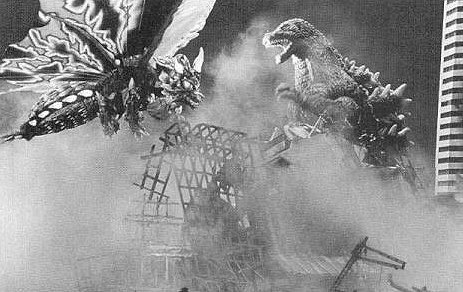 I'm also a bit torn on who to root for - Godzilla is trying to protect the devastated town, because deep down you know that he just wants to be loved and accepted and to live quietly in some kid's aquarium like all the other pet lizards. But Mothra? Mothra has cool wings. By now, as the middle of the night crawls toward the wee hours of the morning, the fluttering becomes more urgent so I wake up Hubbypants and ask him to shine a light inside my ear to see if he can tell who's winning...I might want to place a bet, we could use the extra money for the remodel. I discover that THIS is the source of all the hullabaloo. The little bugger must have seen the light and thought it might as well head to bug heaven. I had been violated by a freakin' silverfish. Damn thing fell right out of my ear and landed on the bathroom floor - that is, right after I felt it emerge and then did the squealing, "Getitoffmegetitoffme" dance we all do when we feel something crawling on us. I am here to tell you that a person does not quickly recover from such a revelation, sleep was not forthcoming after this discovery...OH.NO. Somehow Hubbypants sensed my distress and offered to hold my breasts, the kind and supportive giver that he is. There is a good chance that I'll need to fill my day with errands and shopping just to keep myself awake after so little sleep. And there is an equally good chance that I'll be sleeping with earplugs for the rest of my life. AAAAAAA!! EW EW EW!! I think I'd rather deal with zombies!! Indeed! Zombies I can (maybe) outrun...but ear bugs? Ack! I'm going to join the gaggle of "ewwing" people - EWWWWW!!!!!!! No, no, no, no!! What was it, how did it, EWWW! So now, not only do we eat spiders in our sleep, but silverfish can try to control our brains after entering our heads through our ears. Yeah, I'm so not into bugs! I realize they are everywhere, always...but I'd like them to take 3(million little bug) steps back and keep a good distance away from my personal space! Hahahaha! Yes, it is very, very, VERY disturbing and a chocolate donut would make it SO MUCH BETTER! Can't sleep. Silverfish will invade me.